Congratulations to the winners of the Planet B-Boy 3-on-3: SQUIRTLE SQUAD (representing Paranormal Pandas Crew)!!! 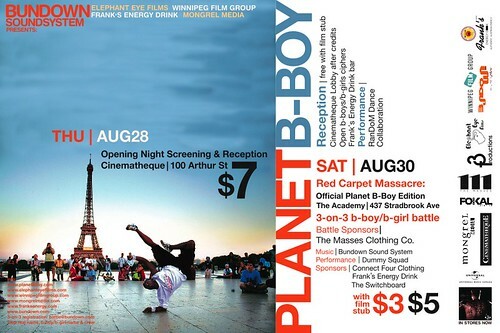 Planet B-Boy SOLD OUT opening night!!! *a showcase by RanDoM Dance Collaboration. Music production by Bundown Sound System. *a showcase by Dummy Squad. FRSH (FunkRapSoulHouse) Experience provided by Bundown Sound System. Major event at month’s end. P.S. No photo blog updates on here right now – because well, a sunny afternoon is more appealing than sitting in front of a MacBook – but if you’re on Facebook, Jay Boogie has some new albums on there documenting our recent movements.